How do I sign up for an Early Years account? Enter your Username or Email Address and click “Get New Password”. You will be sent an email with a password reset link. 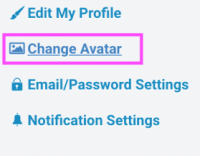 Log in to your account and change the password. What if my organization is not listed on the drop-down list on the Sign Up page? If you are a Learner and your organization is not listed on the drop-down list on the Sign Up page, choose the option at the bottom, “z. I don’t see my organization”. If you would like to sign up as an Organizer, and your place of work is not listed on the drop-down list on the Sign Up page, please Contact Us. What is the difference between an Organizer and a Learner? Organizers may post and edit training events on the EYPD web portal. Organizers must work for an authorized agency or institution as recognized by the British Columbia Provincial Office for the Early Years. Learners do not post events but they may may view and save training event information, track their selections, copy events to their calendar and calculate their professional development hours on myEYPD, their professional development activity page. To create an account as an Organizer or a Learner on the EYPD web portal, Sign Up now. 3. Upload a photo to go with your profile. The recommended dimensions are 300 px by 300 px. How do I keep track of my professional development hours? First, Sign up as a Learner. Once you’re signed up, click on myEYPD in the top right hand corner of the page. A new page entitled, myEYPD will appear. Scroll down to see the Past Events section. This is a list of events you have attended and their associated hours. Click on the “attended” or “did not attend” radio dial and then click on the Calculate My Hours button near the bottom of Past Events section. At the top of myEYPD you will now see many hours you have collected and how many certification hours are still needed. If you have no past events listed you can populate this section by viewing specific training event description pages and clicking on the “Plan to Attend” button. Once the training event you are interested in attending takes place, it will populate your Past Events section. How do I save training events I’m interested in attending? How do I view just those training events that match my interests? Go to myEYPD and scroll to the section Professional Interests. Click on those categories you are interested in. A new page will appear with training events filtered according to your selected interests. What are the benefits of signing up on EYPD? Save training events you’re interested in. Keep track of your professional development hours and when your certificate expires. Search for training events according to your professional interests. Save training events you’re interested in attending. Record hours of training events you have attended. Keep track of when your certificate expires. How do I post a training event on the Early Years website? It is good practice to review the event you have just added. If you’d like to make changes to the event, click “Edit Event”. What are some best practices for posting training events? Include the learning objectives of the training event in the description field. How can I provide feedback about the EYPD web portal? Please use our Contact Us form to send us feedback. What is Early Years Professional Development? Early Years Professional Development or EYPD (https://earlyyearsbc.ca/) is a professional development web portal that enables authorized training organizers to promote professional development opportunities for the early years sector throughout British Columbia. Who created the Early Years web portal? BCcampus is developing, hosting and researching the Early Years Professional Development web portal (EYPD) in collaboration with a project advisory group composed of leaders from the early years sector. The aim of the project is to improve access to and help coordinate professional development in the early years sector in British Columbia. This web portal research project is sponsored by the Provincial Office for the Early Years. Find out more about the Early Years project on the About Us page. Who is authorized to post training events? Publicly funded organizations (supported by regional, provincial and/or federal funds) may authorize their representatives to sign up as an Organizer and post training events. The Provincial Office for the Early Years will review all requests and determine whether the training being offered meets acceptable conditions that support the Early Years Strategy. Who posts events on this site? All training events listed on the EYPD portal have been added by publicly funded (with regional, provincial and/or federal funds) professional education and training coordinators in British Columbia.